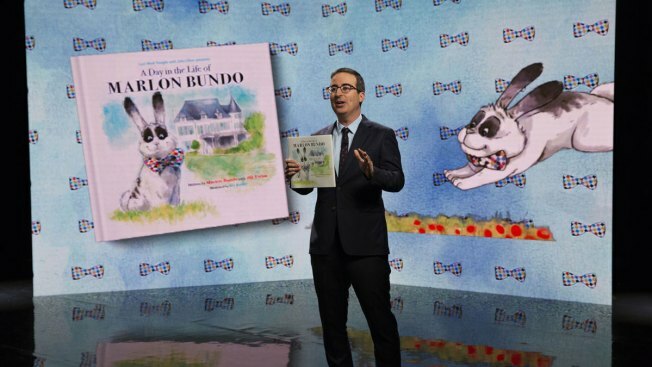 In this March 2018 photo provided by HBO, John Oliver holds the book “Last Week Tonight with John Oliver Presents a Day in the Life of Marlon Bundo." The past week was a good one for picture books about rabbits. "Last Week Tonight with John Oliver Presents a Day in the Life of Marlon Bundo" has spent the past several days at No. 1 on Amazon.com. The book it spoofed, by the wife and daughter of Vice President Mike Pence, reached the top 10. The Pence book is a tribute to the family's pet rabbit. The Oliver book has Marlon fall in love with a fellow male rabbit, a pointed comment on the vice president's opposition to gay marriage and other conservative social views. Chronicle Books, publisher of the Oliver book, says more than 400,000 copies are in print. But the Pences' publisher, Regnery, also was pleased with the response. Regnery told The Associated Press on Monday that "Marlon Bundo's A Day in the Life of the Vice President" was in its third printing, totaling more than 100,000 copies. Pence's daughter, Charlotte, even purchased a copy of the Oliver parody, written by "Last Week Tonight" staffer Jill Twiss. Proceeds from both books are going to charity. The Pences are donating to A21, a nonprofit dedicated to combating human trafficking, and an art therapy program for cancer patients, Tracey's Kids. Oliver's book is raising money for AIDS United and the Trevor Project, a suicide hotline for LGBTQ youth.